Click on the photo and see all the photos of Apto Laguito1602. 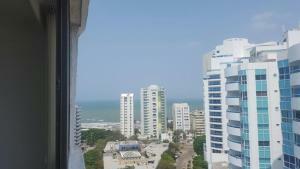 Situated in Cartagena de Indias, 5 km from Bolivar Park, Apto Laguito1602 offers free WiFi and sea views. Each unit is fitted with air conditioning, private bathroom and a kitchen including an oven, microwave and a fridge. A stovetop and coffee machine are also available. Cartagena's Gold Museum is 5 km from Apto Laguito1602, while Palace of the Inquisition is 5 km from the property. The nearest airport is Rafael Núñez International Airport, 10 km from the accommodation. Payment before arrival via bank transfer is required. The property will contact you after you book to provide instructions. Guests are required to show a photo identification and credit card upon check-in. Please note that all Special Requests are subject to availability and additional charges may apply. Please inform Apto Laguito1602 in advance of your expected arrival time. You can use the Special Requests box when booking, or contact the property directly with the contact details provided in your confirmation.